This is Ken Perrott’s response to Paul Connett’s last article Fluoridation debate: Against Fluoridation Thread. Part 6. Discussion in comments section: The quality of the discussion in the comments section accompanying this exchange impresses me. We have kept out the trouble makers who generally dog this issue and this blog by moderation. But the level of knowledge and familiarity with the scientific literature of commenters is higher than is usual. Most of Paul Connett’s associates at his organisation Fluoride Alert are contributing and many of the commenters have a background in relevant professions. So I urge readers to dip into these comments. Yes, there are a large number and it can get confusing. But some of the issue discussed in the exchange are thrashed out in greater detail in the comments. You will find useful information and arguments presented, as well as helpful literature citations. In his last article Paul adopted an approach of attack and discredit and did not deal with most of the issue I raised. He continues to ignore, or even downplay, issues like the normal role of fluoride in bioapatites, the recognised systemic benefits of fluoride, the poor quality or inappropriateness of many of the studies he relies on (and of the journal Fluoride he promotes). This is accompanied by an attack on a broad front where he poses no less than 10 questions he demands answers to. I had expected he would be raising his issues in a more detailed way, one at a time. Laying out his arguments and evidence. But in one go he has thrown them all into the ring without any preparation. It’s a real Gish gallop – suddenly demanding answers about arthritis, kidney function, thyroid function, osteosarcoma, individual sensitivity to fluoride, menstruation, effect on babies, monitoring bone concentrations and finally, all or any health concerns in New Zealand. Without any background to any of the issues. (Wikipedia describes Gish gallopers as using “a rapid-fire approach during a debate, presenting arguments and changing topics quickly). Is Paul “going for broke?” It looks like a military exercise but I wonder what military experts would think of the tactics he is using. Obviously I am not going to walk into the trap of fighting on so many ill-defined fronts. But Paul has at least defined 3 key areas he expects to be tackled – ethics, efficacy and safety. I will restrict my response to these but add some general comments on the nature of science which I think need to be made. But please, note – I am not avoiding those questions – let’s deal with them in a proper way where we have the context and background. Readers may also see that some of these questions are being discussed and answered in the comments section. Paul will correct me if I am wrong – although I would have expected he would already have mentioned any decision favouring his argument. The fact that he hasn’t is telling. Bill Osmunsen (the West Coast Spokesman for Paul Connett’s activist organisation Fluoride Alert) vigorously pushed the “fluoridation as a medicine’ argument in the comments sections of this exchange. Paul works closely with him and James Robert Deal who runs the organisation Fluoride Class Action which aims to achieve a legal ruling declaring fluoridation illegal. So I expect Paul would know of any final ruling declaring fluoridation a medicine. (James has also been contributing to the discussion in the comments sections). Bill was unable to give a clear example of any regulations which define fluoridation as a medicine. Despite this, and the lack of any legal support, this is a common argument used by anti-fluoridation activists. In the end it relies on circuitous interpretations of regulations and a certain degree of handwaving . I don’t propose discussing it further here – except to comment on a recent use of this argument by anti-fluoridation activists in the NZ High Court. This shows how such legal action can play a legal role, even where chances of legal success are remote. The Hamilton City Council recently voted to defer an expected decision to restore fluoridation to the city after an overwhelming referendum result showing voters wanted it. The reason for deferral was to await the High Court decision on the case taken by the NZ Health Trust who argue the South Taranaki Council is breaking the law and breaching the New Zealand Bill of Rights Act by adding a substance they claim is akin to a medicine to the water supply. Some Hamilton Councillors were swayed by arguments that similar action could impose high costs on their own council. Institutions and bureaucrats are easily pressured by legal action – even just the threat of legal action. Several time in my research career managers prevented me from publishing research findings on some products because the distributors who didn’t like the findings threatened legal action if the data were published. I can see similar things happening here as the Taranaki High Court decision will most probably be unfavourable to the Trust and it will appeal. Such a process could go on for several years. Meanwhile other councils, and even individual councillors, will feel intimated by similar threats of possible legal action. Ironically the NZ Health Trust has been very active in fighting any legislation for regulating natural health products because they do not wish to see these products classified as drugs. And here they are attempting to argue that fluoridated water is a drug! The Trust is also active on issues such as Chemtrails, vaccinations, opposition to conventional health, etc. in effect they are advocating for people with some very whaky ideas as well as for the alternative health and medicine industry which is quite a big business in New Zealand. In a recent Listener review Sally Blundell described the vitamin and natural supplement sector as a US$34 billion business (see The final vitamin question). Add the alternative health practitioners and we can get an idea of the commercial forces behind the anti-fluoridation movement. Another organisation threatening legal action is Fluoridegate legal action NZ. This is an obvious astroturf organisation for the local Fluoride Action Network of NZ (FANNZ). Like the other astroturf organisation the New Zealand Fluoride Information Service they operate out of the same address as FANNZ and are used in letter writing campaigns and press releases. Balancing personal choise and social good. Most anti-fluoridation articles and propaganda just don’t attempt this balance. At most they might stress the need for individual freedom of choice but give social good a miss. Usually ethical considerations are limited to arguments around the concept of fluoridated water as a drug or medicine, as Paul has done. More serious authors do consider ethics as basically about this balance. In principle one could consider this balance as represented in values and political attitudes. But in practice this is often distracted by appeal to scientific claims, even scientific misinformation. Some ethicists, whose understanding of the science may be rudimentary and/or distorted sometimes allow this poor knowledge to distort their ethical calculations and conclusions. It is a difficult issue because while science cannot make values decisions for us, such values considerations need to be informed by the science. And if they are informed by bad science there is a good chance the ethical conclusions will be wrong. In my experience debating opponents of fluoridation it is easy to get them to agree decisions like this are political- or values-based but in the ensuing discussion they find it very hard to argue out the values issues. Very often the discussions end up being about the correctness of a scientific claim they make. The science proxy takes over and the real issues are ignored. Why is this? In many cases I think anti-fluoridation activists have not thought the ethical questions through completely. They have got stuck on the “fluoridated water is a drug” or “personal choice” arguments and have never really considered the social good aspect in any depth. So as soon as they feel challenged on the ethics they will resort to using scientific misinformation – dragging in a proxy. In other cases I have heard a few fluoridation opponents stick to the ethical argument. Refuse to discuss the science and declare that for them it is just about personal choice. This is more honest – but again it is hard to get into the social good aspects because these people usually just don’t want to even consider it, or even denigrate the very idea. Often these people will declare they are libertarian in their political outlook. Possibly in the end that is what the issue reduces to – one’s political/values outlook. Not a scientific issue resolvable by research and often not even resolvable by reason and logic. Emotion inevitably plays a large part in such values. In a democratic society these issues have to be resolved (if only in the short-term) by transparent consultation and referenda with the minority accepting majority decisions. It is immature not to accept that. As social animals we are always balancing social issues against personal ones. It is part of living in a social group. I believe that to stress only one aspect is the mark of an extremist. Most people are happy to accept a democratic decision on the balance. It is disingenuous to see a decision about social good amounting to the minority having something forced on them. As a society we support free public hospitals and secular schools. A minority refuse to use these facilities and they are not forced to. They can make their own arrangements and many do. Private schools and private healthcare is common. The cost for people who wish to opt out of the community water supply is surely minor compared with education and hospitals. Another common argument relates to the claimed 1% (or 3%) of the population who are supposedly over sensitive to fluoride and suffer all sorts of symptoms when water is fluoridated. I am happy to concede there may be a small number of people like this – as for other common chemicals in the environment. Frustratingly, the evidence for fluoride sensitivity usually comes from unavailable old papers or very poor research (as Paul’s citations are) or (most often) personal anecdote. At least some of these personal anecdotes may be honest-but-psychological as a study of the persistence of symptoms when residents were told that fluoridation existed even though it had stopped shows (see Fluoride sensitivity – all in the mind?. Frankly, I think at least some of these anecdotal claims are really politically motivated – they often come up when local councils hear submissions from anti-fluoridation activists and are not supported by medical assessment. These appeals rely solely on emotion and empathy. Those people with a genuine sensitivity to common (and often naturally occurring) chemicals in our environment face us with that balance issue. To what extent should society deny itself something beneficial to protect the interests of a very small minority? Very often society does decide that such small groups of people must take responsibility for their own condition and handle their own requirements. Maybe the most empathetic solution is that society as a whole compensate this small number of people in some way to aid them with their predicament. Finally, I think many people just don’t have a concept about the nature of social health policies? Or the benefits they bring to society as a whole. Declaring that people should add their own fluoride to their water, learn how to brush their teeth, etc., ignore the reality of life for so many socially and economically challenged families and their children. Choices like this often cannot be made, or even thought about. (Let’s face it – this is also very often the case with those who are not socially or economically disadvantaged). A social health policy like fluoridated water or salt, and iodised salt, works with such people (in fact with most people) precisely because it requires no action on their part. Simple declarations that we should not have to bear a financial responsibility for those who are not responsible enough to care for themselves and their children gets into “cutting of noses to spite faces” territory. It is in the best interests, financially and socially, of all of us that children do not grow up disadvantaged by poor oral health. It is these children who will in future be paying the taxes to support us in our old age, and providing the services and goods we consume. Let us make sure, even from a purely selfish point of view, that these children grow up to become good citizens with fulfilled lives and the skills and education necessary for this. Surely it is ideologically extreme to not accept this logic? Paul is a political polemicist, certainly not a scientist, when he demands the knowingly impossible. He wants studies showing that fluoride “is not increasing the risk of arthritis,” “causes no damage to individuals with impaired kidney function” and “is not increasing the risk of lowered thyroid function.” He asks for scientific evidence indicating “that fluoride is not a neurotoxicant.” And, of course, when I don’t produce the impossible proof of a negative he, and his fellow anti-fluoridation activists, respond by taking this as “proof” that their claims are true. Are somehow proven! If only science was that easy. Isn’t this argument for negative proof the same as the tactic we have become very familiar with from creationists in their attacks on evolution? Paul’s characterisation of the lack of randomised controlled trials (RCT) and the poor quality of much of the research in this area as problems only for supporters of fluoridation is similarly a political trick. These issues are ones for science in general. Science does not differentiate between supporters and opponents. The opponents of fluoridation are just as plagued as the supporters by the lack of RCTs and the poor quality of many published papers. It is their “fault” as much as that of supporters that there are insufficient research reports on this area of interest. If in fact these are genuine problems for all of us – why blame them only on proponents of fluoridation? That is a political, not a scientific, tactic. After all, anti-fluoridation opponents keep telling me they have science on their side, they have the support of most scientists on their stance and they keep providing me supportive quotes from Nobel Laureates and “top scientists.” Shouldn’t they be levelling these criticisms at the anti-fluoridation scientists and researchers who they believe are so numerous? Or are these charges an admission of the falseness or irrelevance of their claims? More directly, Paul claims to have been researching fluoride for 17 or 18 years. He promotes his book as the last word on the subject and compulsory reading for anyone wishing to comment in this area. Many anti-fluoridation activists describe Paul as the world’s top expert on fluoride. He makes submissions to community hearings on fluoridation – often by video link from the other side of the world. So why is he not taking some responsibility for the lack of RCTs? What has he done to plan or put such trials into action? Why does he blame others for apparent lack of research. Surely if he in his wisdom had deemed such research necessary he would have been one of the first researchers to propose, plan and carry out the research? Come to think of it – with such a reputation it is reasonable to expect a body of publications in reputable peer-reviewed scientific journals. My simple searching does not show any, although he does list 2 which I could not find on-line in a recent CV. Could Paul give us a relevant publication list? And links to the papers? Is Paul’s judgement of the research too harsh? Both sides should be pointing out the real world problems we face as scientists. Humans can not be treated as laboratory subjects. We cannot realistically segregate a population to the degree required for randomised double-blind studies because of all the confounding factors and the halo effect. This it is a problem for both opponents and proponents of fluoridation. It is dishonest to pretend that one side is being devious or avoiding the issue. Rather than making such charges people should consider the evidence that does exist (and this does include the randomised double-blind study of Stephen et al (1984) which showed beneficial effects of fluoridated milk on oral health – see Five-year double-blind fluoridated milk study in Scotland). I often feel the York review was a little harsh to stress the poor quality of some of the available research on fluoride. Genuine science must work with the world as it is. It gets by with epidemiological studies where ideal controlled studies are impossible or too difficult. Scientific knowledge is always provisional, open to improvement as new data and findings come in. Scientific inference on safety and efficacy uses existing information and is not put off until the impossible final experiment can be done. Humans are used to operating in this way, of accepting there will always be some areas of incomplete knowledge, some untied strings, some small doubts and some future work to do. In that sense it is just political disingenuousness to promote the slogan “if in doubt leave it out.” Or to demand, as many anti-fluoridation activists do, that there should be no fluoridation until every scientific i is dotted and every t crossed. There is always some degree of doubt and the final is and ts are never dotted and crossed. When science-oriented people debate controversial issues I sometimes feel I am in the middle of an intense citation battle. Each side throws our references claiming they support their position. Often they accompany the reference by a brief quote. It’s like an intense battle using barrages of paper darts or a game of citation tennis. This is aimed at establishing credibility – but does it? I suspect more often than not it turns people off – especially those unfamiliar with the literature. And when those that are familiar retaliate with their own brief quote and citation to clarify it is just seen as part of a citation war. People need to calm down, stop throwing around citations and quotes in this manner and calmly look in detail and context at the real scientific findings. Yes, unfortunately, this usually requires access to the full text of papers and not just using Google with a good dose of confirmation bias. So, I am not impressed by Connett’s paragraph of about 30 unexplained citations – nor by a long reference list at the end of his article. I am not impressed by the way that anti-fluoridation activists often throw around citations they have never read – or if they have, not past the abstract. Usually they are just copied and pasted from Fluoride Alert without any critical consideration at all. No wonder some of us look on this naive appeal to authority as a sort of citation Bingo. Just waiting for Choi et al (2012) or “Harvard Study” to be thrown at us. Paul might consider that attitude harsh – but let’s take one paper he cites in his list of 30 – Cheng et al (2007). He referred to this paper also in his first article arguing that Cheng et al’s figure (on the left hand below) shows fluoridation ineffective. I pointed out his conclusion was unwarranted because of the weakness of the data and influence of confounding effects in inter-country comparisons. I illustrated this by showing that the data for Ireland could be separated into fluoridated and unfluoridated components (see right hand figure). 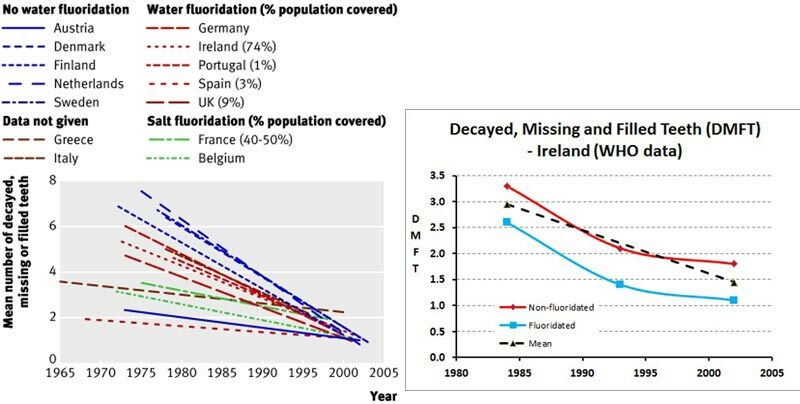 And this comparison within one country (with fewer confounding effects) illustrates that fluoridation was effective. Paul brushed off my response by saying “I would not exclude the researchers’ bias influencing this result!” And he continues to use the same citation. I am sure he will continue to do so in the future despite the criticisms – because he is using these citations like a drunk uses a lamppost – more for support than illumination. He is approaching the literature with a fixed conclusion – searching for citations he can use to support those conclusions, and not basing his conclusions on an objective assessment of the literature. This is the thing about Gish Galloping – it avoids the horrible reality of context and details which often make the claims false. And Gish galloping by citation war is just another way of avoiding context and details but adding a layer of the fallacy of appeal to authority. On the one hand the offender can pretend extensive knowledge and a damning case (even if one or more of there charges are refuted) – on the other hand his discussion partner can be presented as ignorant and without a case when they don’t reply to every single charge in detail. Paul keeps returning to this question. It is obviously central to the message Fluoride Alert promotes and it does seem to catch the imagination of at least some people. How many times have I seen this sort of bald statement on Twitter? 4/12/13 3:51 pm Fluoride acts to calsafiy peniel gland in your brain. That is why HITLER used it in Death Camps. It dumbs you down & makes you complacent. How often do we have the “Harvard study” thrown at us as final proof that fluoridation lowers IQ? While getting a boost from the paper of Choi et al (2012) this is an old myth promoted by extreme anti-communist groups like the John Birch Society – the myth also included Stalin’s prison camps. I have always thought this claim weird as elemental lead in the form of bullets is usually a very effective form of control in such prison camps – surely putting fluoride in the water is not as effective? But conspiracy theorists are not going to give this myth away so easily. It provides handy support for their claims that governments, under direction from the United Nations and as part of Agenda 21, fluoridate our water to produce a population of “sheeples” who won’t revolt! Or that it is some form of population control – even a way of killing off old people! It is ironic that anti-fluoridation activists will on the one hand stress the observation from the York Review team that much of the research in this area is of poor quality – and then work hard to drag up any poor quality research they can find to support the claim of an effect on IQ! Connett’s pre-occupation with this IQ gambit does raise some questions in my mind. I know he does not wish to be put on the spot for every infraction of his fellow activists. But it would be helpful for him to clarify his own position. Does Paul believe in, or support the promotion of, the myth that Hitler and Stalin used fluoride addition to drinking water as a way of maintaining order in prison camps? Does Paul believe that the US and some other governments use fluoridation to keep their citizens apathetic? If not is he prepared to criticise his supporter who do, like Anna Goodwin a local FANNZ activist? Does Paul agree with his fellow activist who believe that fluoridation is used as a form of population control? Mechanisms of beneficial action of fluoride. Misinformation about the mechanisms for any beneficial action of fluoride on oral health is, like the IQ story, central to the political message of anti-fluoridation groups here days. They have seized on improved knowledge about these mechanisms to promote a false scenario. In this they have achieved a certain amount of success. The Hamilton City Council bureaucrats, for example, still promote the message that fluoride water has no beneficial role because fluoride works by topical action (see Fluoridation Referendum Results prepared for the recent council meeting). So I am not surprised that Paul persists in denial of the real scientific knowledge about these mechanisms. I will just summarise the misinformation he is promoting. 1: He continues to avoid the issue of a systemic role for fluoride. He says that my “stating over and over again that the fluoride ion is a natural constituent of apatites doesn’t get us very far.” Clearly he does not want to go in that direction. The natural scientific concentration on the surface mechanism operating to reduce mineralisation and enhance remineralisation as the major effect in limiting caries in existing teeth does help him a bit. But only by omission and turning a blind eye to the studies showing a systemic role with pre-erupted teeth. Papers like Singh and Spencer (2004). Relative effects of pre- and post-eruption water fluoride on caries experience by surface type of permanent first molars and Singh et al (2007). Effects of Water Fluoride Exposure at Crown Completion and Maturation on Caries of Permanent First Molars. And dare I repeat Newbrun (2004), Systemic Benefits of Fluoride and Fluoridation – a reference he has already ignored. 2: Labelling the scientifically accepted mechanism for the surface reaction with existing teeth as “Ken’s topical mechanism via saliva and plaque” is a really desperate shot. As is talk of “scarce data” because I cited only 4 papers! It is obviously not “my ” mechanism but the currently accepted mechanism for the major effects with existing teeth. One could cite expert after expert – none with my name. However, he has at least tried to deal with the details in some of the papers I cited – far more consideration than he gives to the systemic role of fluoride. But of course he has a preconceived aim of finding any detail which he can use to discredited this currently well accepted mechanism. He relies on claiming that fluoride concentrations derived from drinking fluoridated water in saliva and plaque are insufficient for the mechanism. That they are below a specified required concentration (he has even pulled a value out of the literature from Featherstone 1999). He concedes that maybe these concentrations do spike at a sufficiently high concentration but decline too rapidly to have an effect. 3: Paul has seized on a value of 30 ppb F in saliva as a minimum concentration for the surface mechanism. I don’t think that is universally agreed – which is hardly surprising because of the complex chemistry involved. The surface reaction is dependent on the concentration of Ca2+, orthophosphate, F– and not well-defined organic species. It is markedly dependent on pH and the carbonate content of the surface layers of the bioapatite. The interaction of fluoride with the tooth surface is also a dynamic process. The pH changes relatively quickly, dropping with bacterial action on carbohydrates and then increasing – this influences the surface reactions. 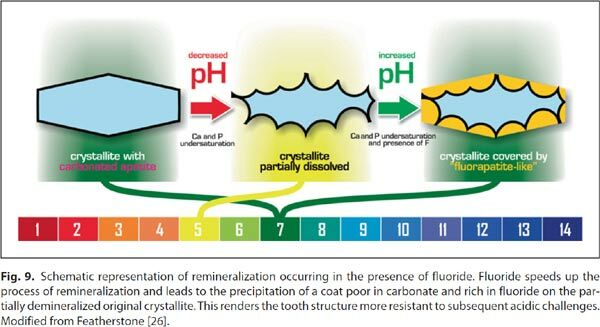 Image credit: Buzalaf (2011), Fluoride and the Oral Environment, Monographs in oral science ; v. 22. Fluoride in saliva and biofilms on the surface reduces the mineralisation process and enhances the remineralisation process. 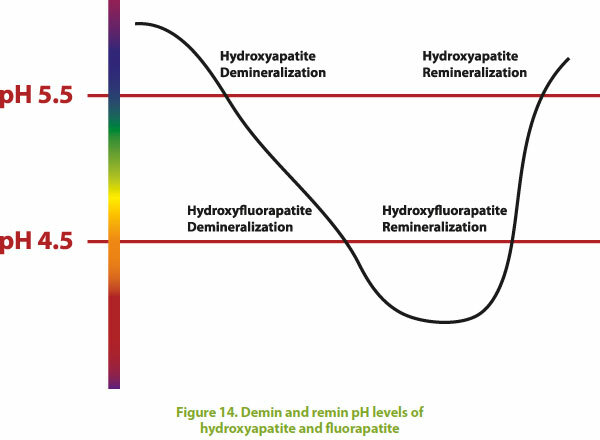 In simple terms we can understand that as influencing the pH values these process occur at. Image credit: Fluoride as a protective factor for tooth decay. Yes, fluoride concentrations in saliva and plaque do reach a maximum after drinking water and eating food containing fluoride, as well as after brushing teeth with fluoride containing toothpaste. These concentrations then decline over the next few hours. DenBenstein (1997) found salivary fluoride concentrations declined to baseline values 45 minutes after brushing children’s teeth. Naumova (2012) showed a similar decline but the figure from her paper illustrates another feature – the high varibaility of the concentrations. However, concentrations in plaque, surface biofilms, decline less rapidly. 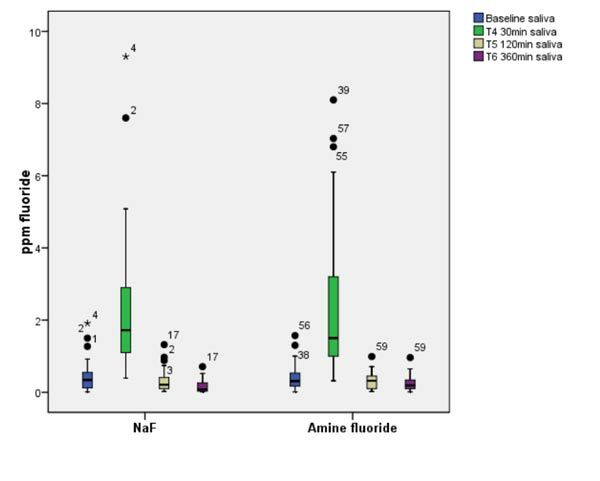 Naumova (2012) reported elevated plaque fluoride concentrations for 2 hours, decreasing to baseline concentrations in 6 hours. Petersson et al (2002) also found storage of fluoride in plaque for several hours. 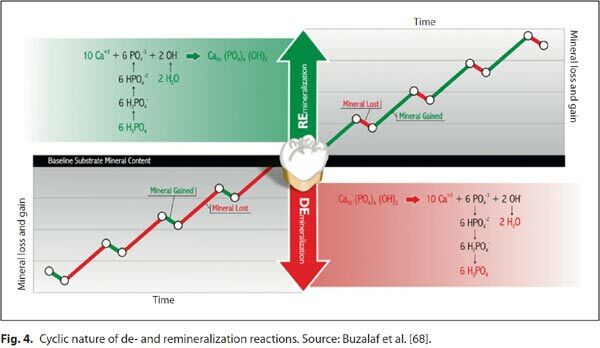 5: ten Cate (1982) reports that susceptibility to mineralisation also declines over time because of the cycling mineralisation-remineralisation procedure. Presumably this is a result of improvement in the chemical composition of surface layers – incorporation of fluoride and removal of carbonate. So, I wouldn’t be putting my money on a single value for the minimum effective value of salivary fluoride concentration required for this surface effect. 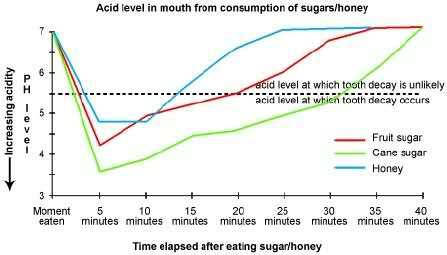 And I can understand why some workers insist that even the low salivary fluoride concentration resulting from ingested fluoride could still play a role. In this article I have dealt in a bit more detail with the ethical questions around the fluoridation issue and the surface mechanisms proving a defence against tooth decay with existing teeth. Depite this, some readers might feel I have spent more of this article attacking Paul Connett’s debating methods, and not dealing with the science. My justification for this is the tactics Paul used in his last article, relying on a Gish galloping presentation of a long list of arguments and the fallacy of authority by quoting, without amplification, a long list of citations. This has been combined with the fallacy of demanding proofs of negatives commonly used by science deniers in the creationism-evolution debate. I think it is necessary to bring these tactics to reader’s attention. This entry was posted in diversity, Health and Medicine, politics, SciBlogs, science, Science and Society and tagged Connett, debate, fluoridation, fluoride, fluoride debate, Perrott, SciBlogs. Bookmark the permalink. You’ve put the Gish Gallop front and centre and given the PRATTs a good airing. I doubt Paul’s supporters will have anything to offer except a weeping and and a wailing and a gnashing of teeth. Thank you, Ken, for exposing the precise reason why this issue cannot be fairly and justly argued in live debate, as Paul and his supporters constantly seek to badger fluoridation advocates into so doing. Gish Gallop cannot be exposed in live debate as it can in a carefully written and presented format such as you have arranged here. Thanks to you, Ken, for doing this and memorializing many of the important “debate” points. Attending to the many hundreds of comments surely was an enormous task. My only thought about the seemingly inevitable descent into the Gish Gallop vortex is the selection of very precise questions and moving on only when the debate on each sharply delineated matter is finished. Certainly, if ever a face to face live debate is undertaken that format must be agreed upon with an aggressive moderator holding a kill switch on the microphone. Otherwise one has simply provided a soapbox for propaganda tirades which cannot be practically addressed either in a strict debate sense nor in the minds of the uncommitted audience. the NZ Health Trust has been very active in fighting any legislation for regulating natural health products because they do not wish to see these products classified as drugs. And here they are attempting to argue that fluoridated water is a drug! Yes, that is just a tad inconsistent of them. @ Billy Budd – exactly, which is why many (most?) scientists won’t get into the live ‘debate’ thing. That, plus the fact that many of us are not particularly skillled at formal debates anyway. Ian, are you not capable of getting the full text? Just requires a payment, usually. There is, however, still no definitive explanation for the current pattern and further analysis of future caries trends in the formerly fluoridated towns would therefore seem to be necessary. There is always insitutional access. How many scientific journals do you personally normally subscribe to? If you want to get all concerned about a particular paper then don’t waste your time parsing one part of the abstract. Buy access to the paper. It would take you just a few seconds. A book review is kinda worthless when the reviewer has not actually read the book. I felt a great disturbance in the Force, as if millions of voices of native English speakers suddenly cried out in terror, and were suddenly silenced. I see you are employing the guilt by association gambit. It hardly adds to any scientific debate about artificial fluoridation to bring up irrelevant issues of population control etc. Greenbuzzer, I am specifically NOT using the guilt by a association gambit. I do not charge Paul with those ideas at all. But he is associated through his activist organisation with people who promote such rubbish. I would have thought it would be helpful for him to put in writing his disapproval of such arguments. Paul has shown himself wedded to the IQ gambit. He and his organisation search far and wide for any scientific reference in any obscure journal in any language to produce “evidence.” He is clearly using the literature like a drunk uses a lamppost – for support rather than illumination. Confirmation bias is not unusual, we are all guilty of it. But I hope Paul will clarify his motivations for this particular preoccupation for the IQ argument. His use of the science is opportunist and the “science” he uses is very poor. Is his use of the IQ gambit simply attempting to support his anti-F position by any means possible? Or is it motivated by a political position as it appears to be in the case of many of his associates? Paul’s simple answer will, hopefully, remove such speculation about motive from our exchange. And, hopefully, by distancing himself from such political attitudes (as I fully expect), he will be providing some sort of guidance to his own supporters. Telling them not to use such evil arguments. Over the last few weeks, there have been some really stupid arguments used by the anti-fluoridationists. Arguments so dumb that they lower the IQ of anyone just reading them. Yet not once do you find a anti-fluoridationist taking another to task for using such arguments. There’s this false sense of solidarity, I suppose. It’s always left to the sane people to clean up the slop. Just once, I’d like to see someone from the other side do some house-cleaning. There’s a smogasboard of derp to choose from and nary a murmur, nary a peep from the anti-fluoridationists taking to task one of their own for saying something that embarrasses us all as a species. A well established legal principle, sometimes even used for jury instruction. You appear interested in the scientific value of a debate. So what do you say about the overwhelming consensus among national and international (health) organisations, (WHO, CDC, ADA, NZMA etc etc….etc) that not only is fluoridated water NOT toxic, it is safe and beneficial? Hiding behind an alias is one way to avoid the fallout from ridicule. Why is the simple concept of complete dissociation so difficult for some people to understand? It is either that or clear efforts to ignore science and intentionally keep posting misleading and mis- information.